Jr High students from the Argyll Centre dug up potatoes to donate to the Youth Empowerment and Support Services. "It takes a village to raise a child" is an African proverb which means that it's easier to bring up a healthy and well-supported child if you have the effort and care of your entire community. The same philosophy rings true when it comes to feeding our children, our families, and each and every person within our community. 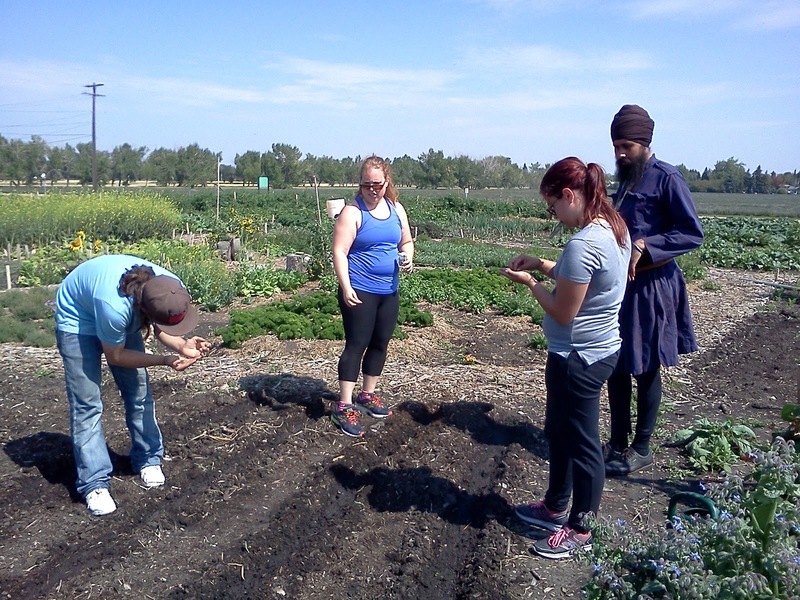 Prairie Urban Farm's volunteers range from children who aren't quite old enough to articulate the joys of gardening to older folks who have been working the soil for generations. That inter-generational diversity creates the community of sharing, teaching, and learning that is so core to what we're trying to accomplish at the farm. Volunteer Iris helps visiting Grade 4 students to taste the kale. Our volunteers are families and children, couples of all ages, university students, youth groups, elementary school classes, and high school classes coming from all parts of the city. Since May these volunteers have been seeding, transplanting, watering, pruning, digging, weighing and harvesting. 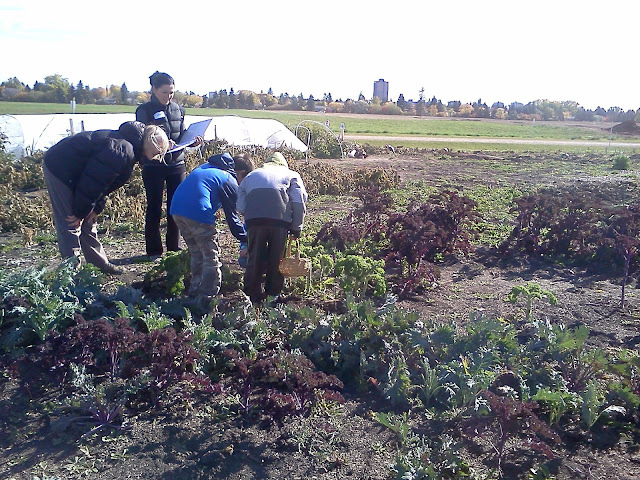 Averaging the volunteers at our sessions over the 24 weeks we've been operating since the beginning of this season, we've collectively sent over 500 bags of farm fresh produce to volunteer homes around Edmonton. 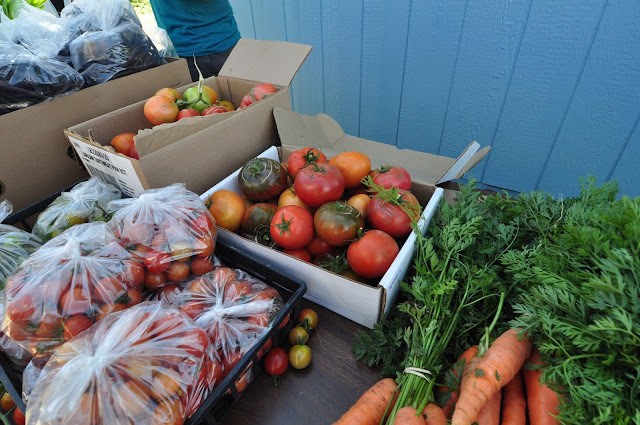 Volunteers harvested, weighed, washed, and packaged produce for sale at one of our summer markets. In addition to going home with our volunteers, we spend time caring for Prairie Urban Farm in order to produce food for all Edmonton citizens. So far we've donated over 550 lbs of fresh vegetables to the Edmonton Food Bank, Campus Food Bank, Youth Empowerment & Support Services, The Neighbour Centre, and Meals on Wheels. 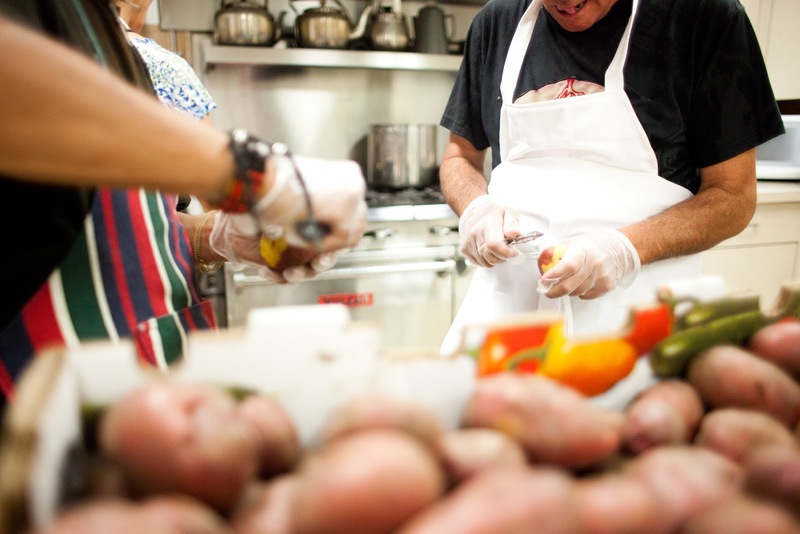 When we pack up a box of harvested produce for one of these community organizations, the vegetables have a history. 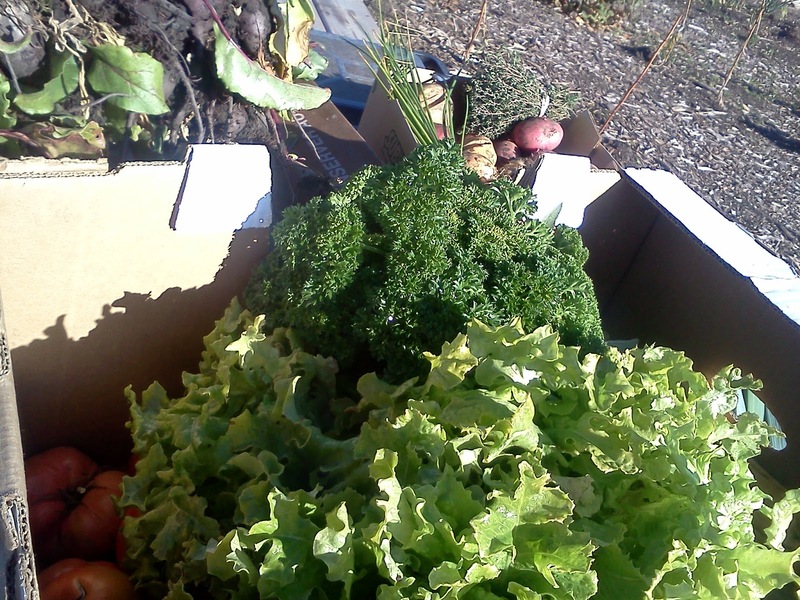 Beets, potatoes, greens, herbs, tomatoes, and leeks donated to Meals on Wheels in time for Thanksgiving. In July our community partner volunteers from The Neighbour Centre and our youth volunteers from E4C's Art Start planted out new lettuce, arugula, and beet plots. 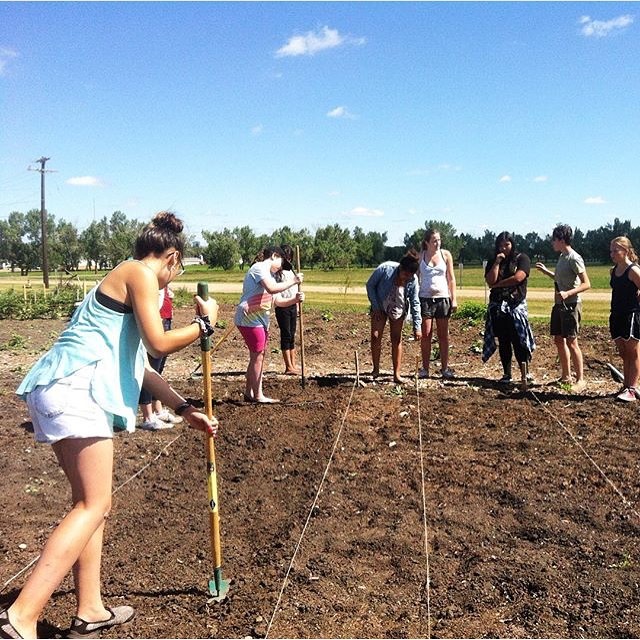 In August our youth volunteers from Edmonton's Inner City High School planted more late-season lettuce. The lettuce and beets donated to Meals on Wheels this Thanksgiving was harvested from those plots thanks to those volunteers in the summer. 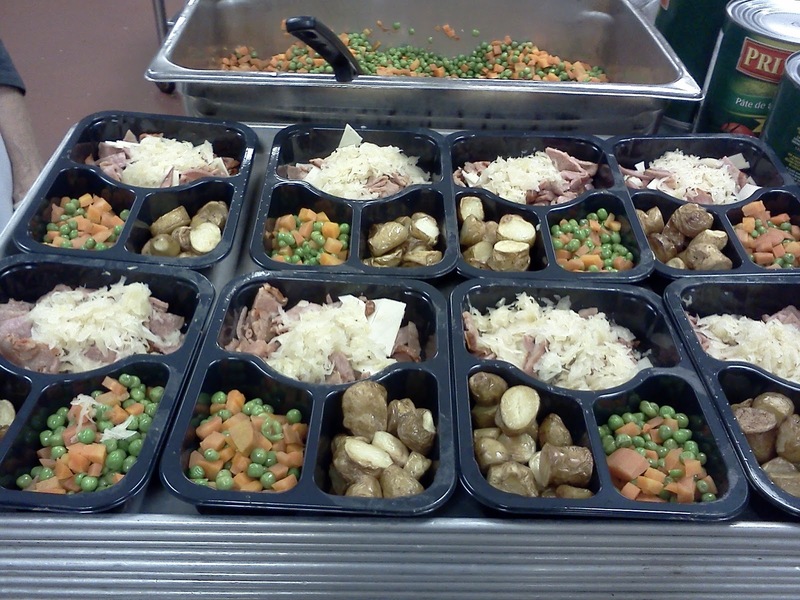 Meals on Wheels volunteers prepare fresh and frozen meals in their in-house production centre under the guidance of Red Seal Chef Robin Cheverie. Edmonton's Meals on Wheels uses this donated fresh produce to prepare fresh and frozen meals that are delivered to homes across the city. The average age of their members is 84 years old and many of their clientele have mobility challenges or other barriers that keep them from preparing meals themselves. By providing Meals on Wheels with fresh produce donations, they're able to keep their meals varied, nutritious, and low-cost for our Edmonton citizens who need their services. Youth volunteers from E4C's Art Adventures Summer Camp create new lettuce, arugula, and beet plots. Youth from Edmonton's Inner City High School plant late-season lettuce rows. This October we had Jr. High students from the Argyll Centre and four different Kindergarten and Pre-school classes join us at Prairie Urban Farm. During their visits they dug up potatoes which were donated to the Youth Empowerment & Support Services and The Neighbour Centre. 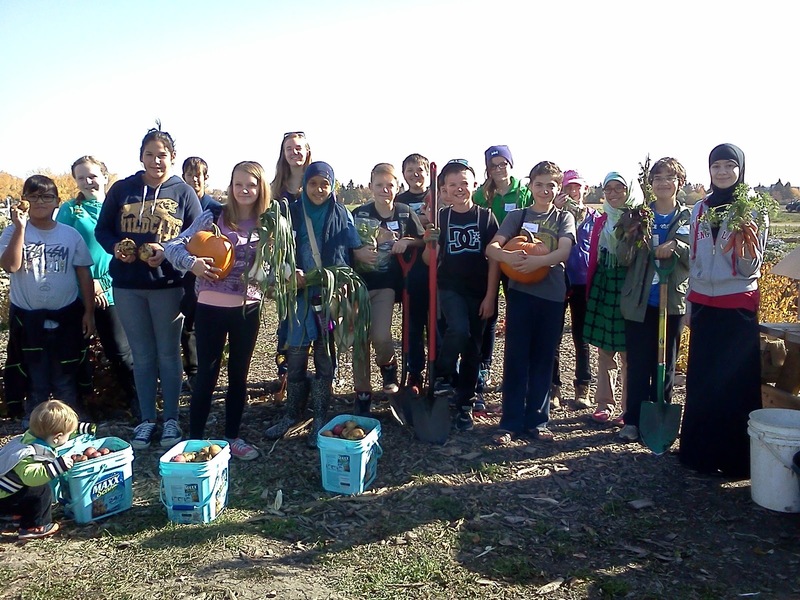 The Jr. High class learned, as they were searching the soil for more spuds, that their efforts would help provide a filling Thanksgiving meal for youth their age living at YESS. Some of the neighbours at The Neighbour Centre were volunteers who helped at the farm throughout the summer, now able to enjoy some late-season fruits of their labour thanks to the youth volunteers digging efforts. Neighbours and volunteers at The Neighbour Centre prepare a nutritious meal at their weekly Dinnerclub. 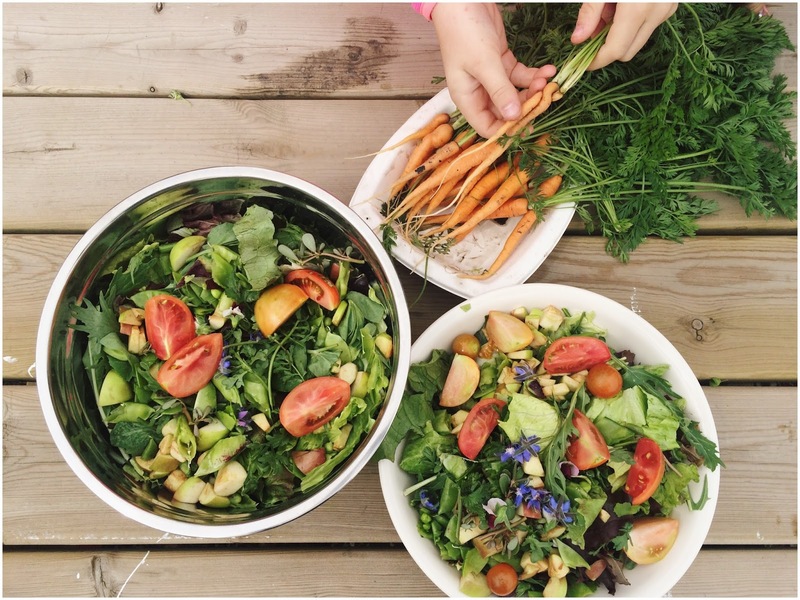 Each time someone at the farm plants a row of greens, pushes a garlic seed into the ground, or harvests a box of corn they have become entwined into the food stories of countless other people in their community. Food transcends all differences and it is a bridge that has allowed us to partner with and get to know youth, individuals, families and groups across the city, our village, who are working to make sure we all have enough to eat. A salad party at Prairie Urban Farm during E4C's Art Adventures youth summer camp. Mmmm eating veggies has never looked so good! The Neighbour Centre is a drop-in resource centre for adults living in poverty. They're "spreading good through their 'hood". Staff, volunteers, and 'neighbours' (people in the community using their services), came out to volunteer at Prairie Urban Farm every Monday morning from July - October. They harvested produce for their drop-in centre and for their weekly Dinnerclub (where they all get together and cook a meal in a community Church kitchen). E4C's Art Start has been collaborating with us since 2014 in facilitating art projects at many of our community events. Art Start is a free after-school art program offered in lower-income schools across Edmonton. This year we hosted two days of the Art Adventures youth summer camp which brought over a dozen youth to the farm to learn about food security and urban agriculture. Do you have fresh produce to donate? Bring it to any of the community service groups mentioned in this article! Chefs and volunteers on-site at YESS will create wonderful meals to feed and nourish at-risk youth living across the city. Food Banks will keep fresh produce in their coolers until they can include it in hampers going home with people.